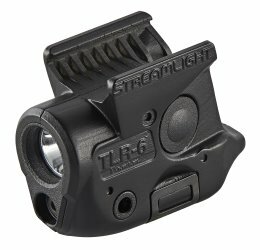 EAGLEVILLE, PA, February 5, 2019 – Streamlight® Inc., a leading provider of high-performance lighting and weapon light/laser sighting devices, introduced a new version of its ultra-compact TLR-6® rail mount weapon light, designed to securely attach to the rail and trigger guard of SIG SAUER®P365® subcompact handguns. The new light/laser module, which uses an ultra-bright power LED, also features an integrated red aiming laser. This entry was posted in Accessories, Tactical Lighting and tagged P365, SIG SAUER, Streamlight, TLR-6. Bookmark the permalink.